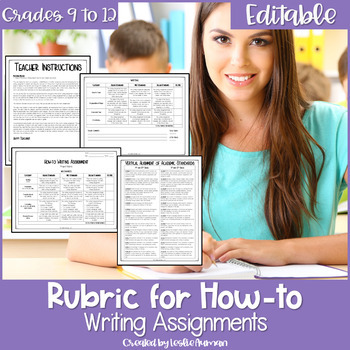 Knock down the time you spend grading how-to writing assignments with editable writing rubric for high school! This resource includes a ready-to-print version and a customizable PowerPoint file, and it's aligned to Common Core standards for 9th through 12th grades! Use it with any how-to writing assignment in your English language arts class! Do you need a rubric for upper elementary instead? CLICK HERE! 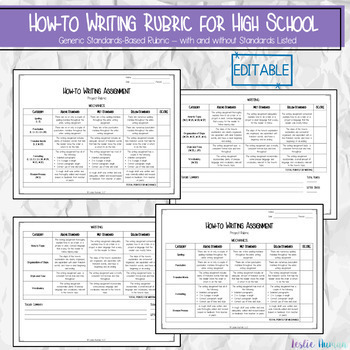 Do you need a rubric for middle school instead? CLICK HERE! ◾ This how-to writing rubric can be used for ANY how-to writing assignment that you assign to your students. If either of the ready-to-print PDFs work for you, then you can use that, but there is also an editable PowerPoint file so you can customize it to fit your curriculum needs. 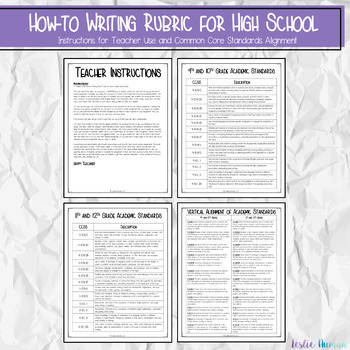 ◾ The teacher instructions page included provides tips and suggestions for using this how-to writing rubric. I share ideas for helping students understand how they'll be assessed with the rubric and for structuring class time for working on the writing assignment. ◾ The rubric already includes benchmarks based on the standards to which this resource is aligned, but I left the score column blank for your use.